Forecast financial markets through seasonal analysis, statistics and algorithms. Forecast the direction of the market through seasonal studies that show how the data of a market experiences regular and predictable changes that recur every calendar year. Read additional charts like the Success percentage in each month to understand deeply the seasonal behavior of the market of your interest. Explore the ForecastCycles big database to analyze all the markets you want. If a symbol of your interest is not present in our database, just ask us. Discover each day which are the strongest symbols in which to invest long or short through ForecastCycles algorithmic model based on seasonal analysis. Create the seasonality of a ratio between 2 market and improve your spread trading results. Explore some of the ForecastCycles services by creating a free account. No credit card required, just your name and email. It's the first created and main area of ForecastCycles, offering 6 different charts showing the seasonal studies and statistics of the selected financial symbol that could seriously help a trader to forecast the direction of the market, especially if he is able to join that indication to other confirmations. 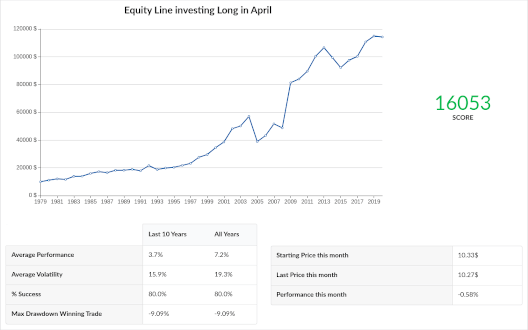 It’s a ranking of the best indication derived from the ForecastCycles algorithmic seasonal model that analyze all the database instruments and make an output of the best opportunities (long or short) in which to invest in the current month. With few additional technical/pattern filter these indication can really be disruptive. This section contains the list of all the ForecastCycles financial symbols which is possible to analyze through seasonal studies and interactive charts. It’s possible to search and filter symbols by category (bonds, indices, forex, etc. ), sector or industries or country (for stocks). ForecastCycles data goes through strict quality control to ensure its users the highest possible precision of data, studies and indications. Interactive charts show all the symbol’s available history and allow technical analysis through advanced tools. It’s also possible to analyze ratio and spread between two financial symbols. These offers are available for a limited time! Keep in touch with the latest news from ForecastCycles. ©2018 ForecastCycles | All Rights Reserved. ForecastCycles will not accept any liability for loss or damage as a result of reliance on the information contained within this website including data, quotes, charts and algorithmic ranks. Please keep in mind that our services have got a learning purpose and we do not suggest any kind of investment, thus we decline any responsibility for investments made according to information taken from this website. Please be fully informed regarding the risks and costs associated with trading the financial markets, it is one of the riskiest investment forms possible.